People who practise juggling regularly say that it helps them stay fit and also improves their concentration. 9-year-old Kenneth Thomas is a juggler and he believes the skill he’s picked up helps him in more ways than one. Yes, with academics too! “I love juggling as it is a rare skill that many people can't do. Juggling has improved my agility, balance, coordination and spatial awareness. There is a great improvement in concentration and thinking skills. I am more focused now and can do research better. I enjoy practising juggling with my brother,” he says. In fact, he will soon be delivering a guest lecture in his school about juggling and balancing. Exercising regularly and staying fit is on everyone’s list of resolutions. However, keeping up a fitness routine can be boring and tiring. But now, a new form of exercise that combines fitness goals with fun is becoming popular – juggling! Juggling has multiple health benefits, both physical and mental. Regular practitioners say that they find improvement in their hand-eye coördination, reflexes, peripheral vision and a host of other motor skills. It is also believed to improve concentration, ability to set goals, analyse and solve problems, and build confidence. Thomas is a student at Bengaluru-based Chaos, an entertainment group which has jugglers, hula- hoopers, poi artists and actors. They do stage shows for 2-3-minute filler acts or a full 60-90-minute performance. The team consists of six members - Mahit Warhadpande, Gunjan Saraf, Shrinivas Bhat, Shivam, Arjun, and Felix. They meet regularly to practice and have performed at several events, TV and stage shows. 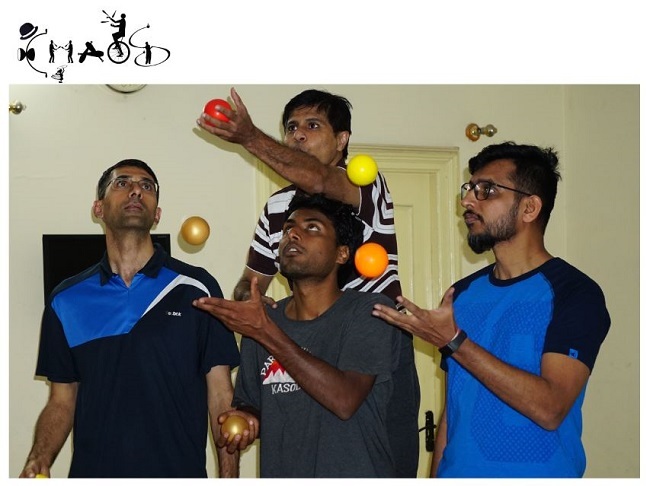 Chaos has conducted several workshops including a seminar at the Sheila Kothavala Institute for the Deaf -SKID Bengaluru, International Play Conference and the Indian Juggling Convention (InJuCo). Gunjan Saraf has been juggling since 2003. Juggling and hooping have been his go-to sports to keep fit. “When I started learning juggling, I lost 10-12 kgs in a year. More recently I lost 7.5 kgs in 40 days with hooping,” he explains. Gunjan says that juggling has impacted his way of looking at things, too. Among their students is 8-year-old Nivaan Kekre who joined them after watching his best friend perform some cool tricks. “I got interested in juggling when I saw my best friend perform the juggling tricks. Looking at me now, my father got interested and, I have become his juggling teacher,” he quips. Working together is a key aspect of juggling. He is also fascinated with the mathematics of juggling which makes everything fall into place so neatly. Shrinivas has performed juggling on a unicycle at many events. Shivam has always been a sportsman and loves to play cricket, football, and badminton, but juggling is a convenient sport as he can practise it at any time and in any place. He credits juggling for the improvement in his confidence levels and creativity. “After I started regular juggling practice, I feel more focused at work. I used to write poems occasionally, now I have started writing poems more often. To ensure that I don’t miss out anything, I capture the thoughts pouring out of mind into my mobile phone”. The brain, like many parts of the human body, needs regular exercise in order to maintain strength and vitality. Some common brain strengthening exercises include crossword puzzles, Sudoku, and other word-and number-based brain teasers. Juggling is believed to help build brainpower and increases your problem-solving capacity. Any form of physical activity tires you out and this helps you sleep better. “Exercise of any form helps boost the immune system, juggling does it the same way. It also helps increase the body's stamina and gives a boost to the endurance capacity of a person,” says Mahit. His students love what they have learned and find that juggling has had a positive impact on their lives in many ways. There are many YouTube videos that teach juggling, and you only need a couple of balls to start!